At our vision center in Salem, we believe that clear vision and ocular surface comfort starts with a healthy tear film. The tear film is a complex arrangement of mucous, water, and oil with a mixture of immune proteins that bathe the eye. The function of the tear film is to nourish and protect the underlying ocular surface while maintaining comfortable, clear vision. It is the balance between structure and function that allows this concert to play out unconsciously. Many internal and external influences can disrupt this process and cause disease. When disease occurs your eye care provider can diagnose, educate and discuss with you the treatment options to improve the overall health, comfort and clarity of vision affected by dry eye disease. 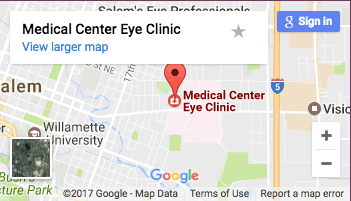 At Medical Center Eye Clinic, we are the best place for dry eye treatment, Salem OR has, so contact us to day get help. Symptoms of dry eyes range from non-painful, variable visual acuity, to mild symptoms of light sensitivity, irritation, stinging, burning and a general tired feeling. However symptoms can, in extreme cases, result in debilitating pain and permanent vision loss. It tends to worsen throughout the day and with activities of concentration such as working on a computer or reading. In some cases, such as people with sleep disorders or who wear oxygen at night, patients may experience symptoms that are particularly worse in the morning upon waking. We all live on a spectrum of dryness. Every day the surface cells of our eyes are working hard to maintain just the right balance of moisture and concentration. That process is influenced by many things including age, gender, systemic disease, and medications. Other factors also play a role such as eyelid function, previous eye surgery, and the use of topical medicated eye drops. In general, symptoms of dry eye are seen in adults and worsen with age. Female patients are much more likely to be symptomatic compared to their male counterparts. The reason is believed to be due to hormonal regulatory factors involved in dry eye disease. Therefore, peri-menopausal and post-menopausal women are much more likely to suffer with dry eyes. People who a have a history of systemic inflammatory disease such as diabetes, thyroid disease, rheumatoid or auto-immune disease have increased ocular surface inflammatory mediators that promote dry eyes. Finally, medications have the potential to dry out mucous membranes and the eyes are not immune. Any medication that dries out the mouth will also dry out the nose and eyes. Some of the biggest offenders are pain medication, allergy medication, certain types of high blood pressure medication, psychiatric and seizure medication. Moreover, patients undergoing or who have recently undergone systemic chemotherapy are at particular risk for dry eyes. Ocular anatomy and physiology is crucial to the health of the tear film and needs to be evaluated for its role in dry eyes. Furthermore, eyelid, or any ocular surface surgery that disrupts the normal distribution of the tear film can result in dry eye symptoms. The good news is there are treatments available to help. Often, treatment is not straight forward and therefore an individualized treatment plan that includes lifestyle modification, over the counter products, prescription medicine or even interventional therapy should be utilized for successful treatment. If you suffer from the symptoms of dry eyes and are frustrated with the lack of attention and success of past treatments please come see any of the board certified ophthalmologist located at Medical Center Eye Clinic for a consultation.